Ask fellow campers about "Travelers World RV Resort" and nearby attractions. Excellent campground. Sites were close together but nothing abnormal for the city. $9 Uber to Alamo or River Walk. You can get on the river walk bike path right next to the park. Very safe biking. We would love to come back. We camped at Travelers World RV Resort in a Motorhome. San Antonio River Walk is a must do. The tours there are an excellent way to learn the town's history. We spent five nights here while visiting the Riverwalk, Missions and the Alamo. The site was nice and long for our motorhome and towed vehicle, and the grass and trees were pretty.......but the surrounding area outside the fence was very SHADY! We heard constant sirens during the night, and we were warned to "be sure to keep things locked up, especially bikes", as some of the neighbors had theirs stolen. The managers/owners and office help were not friendly or helpful, and didn't seem to want to return a smile. LOL! The bathrooms and showers were cleaned once a day, but had a lot of traffic.....and it showed. The exhaust fans didn't seem to work well, so you took a "sauna" instead of a shower. LOL! Overall, the grounds were very well kept and it was a convenient place in which to stay to see the Riverwalk and surrounding area since the bus stops were right at the entrance. We camped at Travelers World RV Resort in a Motorhome. Not in the best neighborhood of San Antonio, but always felt safe, especially in the park and along the miles of river walk adjoining the park. They raked the gravel sites between campers like Disney. Clearly they took a lot of pride in the appearance of the park. Good Verizon coverage, very bad AT&T coverage, Campground Wi-Fi was so-so (average). 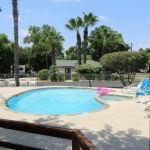 Very close to downtown San Antonio and the Alamodome. Our site had a broken sewer connection, but I made it work. Very little room for the toad. We camped at Travelers World RV Resort in a Motorhome. Follow the park’s driving directions (not your gps) to avoid a sketchy neighborhood and a very difficult (sharp incline) railroad crossing. Very nice park, amenities and staff. I was initially concerned about the location (not in the nicest neighborhood) but I never felt unsafe within the park. Many restaurants and stores nearby. Close to the freeway, but I never heard any highway noise. One star withheld because my electrical hookup was actually at the electrical pole. Thankfully I have a long cord or I would've had to move sites. All sewer hook ups are at the very back so extension hoses are a must. We camped at Travelers World RV Resort in a Travel Trailer. Riverwalk 12 minutes via I-37. HEB, movies and plenty of fast food options across I-37. This review is a bit more detailed. Lovely, clean park. Many seasonal, beautiful sites with some of the nicest people who are very welcoming. Unfortunately have to address issue with reservations. We have stayed here for short visits several times so decided on a 1 month stay. This was prompted from an email we received from Sun resorts promoting such stay and including Travelers World. We immediately called (August?) and were told without hesitation that there was "nothing available" for November. We offered flexible dates, were willing to take a back in site, and even stated we would switch sites during the month. The online reservation system displayed several available sites but the woman we spoke to again stated "doesn't matter what it says online". In October we decided to call and just reserve one week in November which we were able to do easily. Imagine our disappointment when for our entire week there were multiple (20+) sites that were open, and other guests stated several sites had been open throughout the month. Unfortunately we could have filled one of those spots. We camped at Travelers World RV Resort in a Motorhome. This park is an inner city campground. Your GPS will take you on a horrendous route once you leave the interstate. BE SURE you get directions from the campground. Very important. Campground staff was acceptable but not as friendly. Tended to be quite short and direct with any exchanges. It was unsettling after a nightmare getting to the park. We camped at Travelers World RV Resort in a Motorhome. Very convenient to San Antonio and the Alamodome. We were there for a multi day event at the Alamodome. We used Uber to go back and forth. Extremely convenient and cost effective versus driving & parking. I agree with most of what other reviews have said about how clean and nice this park is, they really do a great job of keeping it maintained. The only thing I will add is that it is big rig friendly. We tow with an HDT (heavy duty truck) and our total length is 61 feet. We had plenty of room to park and even park our golf cart behind us with in the site. Power pedestal was on the curb side of camper, but my cord was able to easily reach under camper. 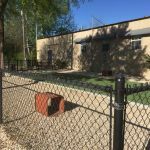 Nice dog run and plenty of green space too. Laundry room was really clean $1.25/wash $1.50/dry, bring change. They have wifi and cable, but I used my DirecTV and my mobile Internet connection with Verizon. Overall an awesome park and would highly recommend it for your stay in San Antonio! We camped at Travelers World RV Resort in a Fifth Wheel. Pretty good reasonable priced Mexican restaurant right across the street. Walmart right down the road. Alamo and Riverwalk very close, plus bus stop right out front and for $2.75/all day is pretty awesome. Be careful as the routes change late evening and the bus routes are not the same as during the day, but the bus drivers are great making sure you get where your going! Park was very clean and staff was great. Game room and library were nice. There is bus service into DT San Antonio right outside the gate. Cost is $2.75 for an all day ticket. (Parking DT was over $12 for only 3 hours!). I would definitely stay here again. The park emails directions when you make your reservation. Use the park's directions, not GPS - there are low bridges. We camped at Travelers World RV Resort in a Fifth Wheel. Take the bus DT to the Alamo and River Walk. It is convenient and much cheaper than parking. This is a very nice park. The roads are wide and paved. The sites are loose stone (not dusty gravel), have patios, very nice grassy areas (the entire length of the site) and some trees or bushes. In general, the park is very well maintained. Restrooms are very nice. Nice pool and workout room. Dog park is nice too - has astro-turf, but clean and has some shade. The park is adjacent to the Riverwalk bike/waking trail that goes all the way to DT San Antonio. Clean, quiet, safe. We camped at Travelers World RV Resort in a Motorhome. Thank you Deb and Chris for leaving us a review about your stay at Travelers World RV Resort. We are so glad that you enjoyed your visit to the area and we hope that you will come back and stay with us again soon! This park is very well maintained, quiet, well lit. The pool decking was resurfaced and the pool was closed but opened a day after our arrival. Interaction with the staff was brief and congenial. There are quite a few trees and nice grass. The only issue was the men's restroom at the club house. Although the showers and restroom was very clean the door on the men's toilet room would not latch so you might get walked in on. We stayed here in a 35' 5th wheel and would stay here again. 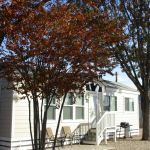 We camped at Travelers World RV Resort in a Fifth Wheel. Convenient to historic missions, the Alamo and river walk but not close enough to walk. Thank you D Bailey for leaving us a review about your stay at Travelers World RV Resort. We appreciate your feedback about the restroom latch and will pass this information along to our maintenance team. We hope that you will come back and visit us again soon! 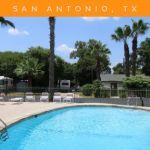 Very nice campground close to downtown San Antonio and the National Park missions. Easy in and out and the sites are paved and level. We would stay here again. We camped at Travelers World RV Resort in a Motorhome. Thank you slay for leaving a review about your stay at Travelers World. We are glad you enjoyed your visit and look forward to having you back on your next trip to San Antonio! First time staying here and would return again. After reading prior posts with positive comments, I agree with them. Perimeter of park is occupied with permanent residents, but sites are neat, well kept and a minimum of items outside the campers. Permanent residents are becoming more of the norm for most campgrounds and it is not an issue with us if the are maintained properly. The on-line photos are a good representation, but the angle of the pictures indicate lots of trees so that is a little deceiving. No shade at pull throughs. Center section have long pull through. This a well maintained park. There is no trash on grounds and workers are always present. 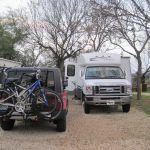 Utility connections are slightly behind the center of RVs after parking. Oddly some electrical is not on the normal hook up areas and a few campers had to place their power cords under their rigs to reach power. Very nice dog run. WIFI good. Cons: No shade on the pull through. Back ins on the perimeter have shade in the morning. Opposite side of the park has shade in the late afternoon. The brutal heat wave requires you to run both ACs from morning to late afternoon. Cable is adequate but not a lot of selections. Water pressure is beyond necessary. They warn you on check-in that water pressure is 165#s. They should spend money to install a regulator to reduce it to a normal range. Although they have a pool and laundry-which we did not use-this is not a resort thus pricing is a little high. The cost of staying is difficult to find and one must call to obtain that, Many discounts and they discount for veterans. Not something I have seen much. 2 nights paid and 3rd night free. We stayed 6 nights and I had to do the math for the person who took my reservations. With a veteran discount and 6 nights charge would be for 5 nights to make the math work. They tried to bill me 10% off but eventually got the correct rate. 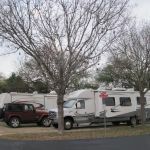 We camped at Travelers World RV Resort in a Fifth Wheel. Thanks Tigggerdad for your very detailed review. We take pride in the upkeep of our resort and are very glad that you enjoyed your stay. Also happy to hear that you were able to use our new military / veteran discount program. We appreciate your business and your service to our country. We hope to see you again at Travelers World or at another Sun RV Resort. Very nice campground. Bathrooms and facilities were extremely clean. Nice swimming pool. Staff was friendly and helpful. Just catch the bus right out front to the River Walk. Good Mexican restaurant right across the street. Definately would stay here again. We camped at Travelers World RV Resort in a Tent Trailer. Thanks Greg Hanson for sharing your review on your stay at Travelers World. We are so glad you enjoyed your visit and the amazing local cuisine! We look forward to having you stay with us again. Easy drive into downtown to visit Alamo or Riverwalk. No free parking - typically $15 for 4 hours. You can also take the city bus for $5.20 round-trip across the street from CG on Roosevelt Ave. Takes about 20 min. Had dinner downtown at the Market Place "Mi Tierra" restaurant for authentic Mexican food with great atmosphere. If possible do Riverwalk in the evening for a unique experience. The campground is close the the Missions and to the downtown area. The river walk is every bit as awesome as you've ever heard. We enjoyed touring the San Jose mission near the RV park more than the Alamo mission. More to see and not nearly as crowded. Some of the sites had power on the passenger side which was a bit strange. We were first given a spot with too much tree coverage (83) for satellite usage, so were able to switch to an open site. Since it was Sunday, we visited the Cornerstone Church, which is a 30-minute drive to the north. The church has a 5,000+ seat sanctuary and an amazing (huge) choir and band. Even if you're not a religious person, it is worth attending a Sunday morning service. 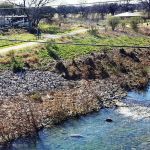 The park is at a great location to everything, River Walk, Missions, Alamo. Bus stop to downtown across street. Very easy and avoid expensive parking! Close to San Antonio Mission. An all day bus pass is $2.75 and well worth it as the bus stop is directly in front of the park and takes you downtown to the Riverwalk and the Alamo without the hassle of street navigation or the hunt for parking. The bike trail is a little long to downtown but well worth it. Park your bikes at San Fernando Cathedral on a bike rack. Take a lock. Eat guacamole at Boudro's. The river boat taxi is fun and it will take you through the locks and dams on the way to Pearl Brewery. It is pricey at $16/person for day pass. There is a bus stop right across from the entrance to the campground so you can take the bus to downtown if you like. We chose to drive our car which worked out find - found a parking lot easily. Don't miss the San Antonio River Walk. Take the bus to see the river walk. This park was close to downtown and easy to find. We did a lot of sightseeing in San Antonio visiting the historical sights, Alamo, and Riverwalk area. We spent a day doing the Missions. Do not go north to get on I-10 from the park. There are two 11 ft. 3 in. bridges that you would have to go under. We could not get under them, so we went back the way we came. We would definitely stay here again. If you're a golfer, you'll want to take a drive (approx. 20 miles) to see The Quarry Golf Club as many of the holes are built in and around an old rock quarry. The view from the deck of the restaurant will make you want to play thus beautiful course. There is plenty to see and do in San Antonio. We toured the Alamo and also watched the IMAX movie on the history. We toured San Antonio; bus stop in front of RV park. The restaurant Guadalara across the street is excellent hole in the wall. Good prices and big servings. You're a very short drive to downtown SA and the tourist places. Big Lou's Pizza on the east side of town is wonderful. 4 of the 5 missions( the Alamo is the 5th) are south of town, right near the campground and an easy drive. They are more interesting than the Alamo, to be honest. Walmart is a mile and a half away too. Definitely use the bus to downtown. It's much easier all around. Try the Southtown Pizzaria about 10 min. toward downtown. Very good Italian and Pizza. Bike or take a bus downtown both are convenient. The bike trail is the river trail 5 miles upstream and uphill. Very scenic. Bus to downtown is convenient and cheap. Wonderful place. Walmart within 5 miles. Convenient to ride bus downtown which we plan to take our next visit. The River Walk area and the Missions!! La Villata, near the downtown River Walk, features local artists. The Market Square is a fun Mexican bizarre. Don't miss The Saga, a night-time laser projection show at San Fernando Cathedral. The Taqueria across the street has a good solid dinner. If you value time over money, skip the half-hour bus ride and drive 10 minutes to pay parking lots downtown. Great restaurants, super sites to see, tours to take and con isn't shopping areas nearby. Don't miss seeing the missions, take a Toyota plant tour, even the SAS shoe tour. Do not miss the light show at San Raphael Cathedral. That is definitely a must. Without a doubt we know you'll be walking on the Riverwalk. Keep in mind it is 15 miles long. Bus stop right out front, 5-10 minutes from downtown san Antonio. Might not want to stay near dog park unless that is your specific desire. I'm a dog lover but fair amount of incessantly barking dogs which gets old after a while. Little Mexican restaurant right across street with good food. Alamo, Missions Caves, Zoo, River Walk and boat ride ect etc etc. Mission Trails and Missions, River walk, museums, Cathedrals, Basilicas, easy Texas Gulf Coast and Hill Country day trips topped off with good Mexican Food and Frozen Margaritas right across the street at Taqueria Guadalajara. Walmart, HEB and golf course near by. Good burger shop just up the street and good Mexican food in the restaurant across the road. Take the bus into downtown. Parking there is pricey ($12-$18 for 2 hours). Bus was convenient, clean, and safe. We returned from Riverwalk at 9 pm on Friday night--no problem. Local residents riding the bus were friendly and very helpful. The bike/walk trail behind the park is very scenic and another great way to explore the area. Public transit available across the street at $ 2.50 / day is great. I was a bit disappointed that the River Walk is almost all restaurants and very few shops, and there are a lot of stairs to negotiate. But it's really beautiful and definitely worth seeing. La Villita can be accessed right from the River Walk and there were lots of really nice little art galleries and shops there in this little "art village". Use the bus to go downtown! It was very easy and way better than trying to park our dually down there. Correct change required. We bought the 24 hour passes for a few cents more, just because it was easier to have that exact change ($5.50 for two of us). Otherwise $1.30 per person each way. The Taqueria Guadalajara across the street had very good food, although the appearance of the restaurant might make some people think twice. We had one breakfast and one dinner there. There is so much to see in San Antonio. Visit the missions including the Alamo. The mission visitor center at Mission San Jose is just a mile South. Walk the river walk - it's beautiful. There is a local Mexican Restaurant practically across the street from the park. It's clearly a local favorite. I think we had the only non Texas license plate. It's open for breakfast, lunch, and dinner. Go there! Don't forget - get entry and leaving directions from the park. Alamo Tours can be signed up for right at the park office. This is a day tour of San Antonio. The city bus will pick you up right across the street from the park office and take you to town for a fee. The park is located in town, so you will be in quite a bit of traffic driving to the park. DO NOT FOLLOW YOUR GPS to the park. It will take you down a street that will be a problem, regardless of what type of rig you drive. Go to the park website and get their driving directions...or call and have staff relay the instructions! Make sure you phone the campground ahead of time and get directions--do not use GPS! There are some RV unfriendly roads you'll need to avoid. Must see: On Tuesday, Friday, and Saturday nights, the illuminated Cathedral downtown. At 9pm they put on an amazing laser light show with music depicting the history of San Antonio--beautiful!!! Also, we found the best restaurant outside of the river walk--it was across the street in the "market" and called Mi Tierra. Be sure and check out the missions. They are very interesting and beautiful. Some of them still have worship services. Be sure and do the Alamo. Lots of history there! Great burgers south of park at Mad Mack's for lunch! Mission San Jose just a little further down. Easy bus ride to River Walk. Nice bike/walking trail at River Walk trail at side of park. The River Walk is 3-4 mi north and Mission San Jose National Historical Park is 1-2 mi south. The city bus (#42) stops at the front of this park. We drove t0 the historical town of Gruene (pronounced Green). It is about 40 miles north east of San Antonio. What a great place to visit. Lots of old buildings and fun shops. It is definitely worth driving the 40 miles. Lots to see and do there. Very convenient to downtown San Antonio. Downtown parking could be tight during peak season, though. The best way to downtown is by bus, skip the hassle and cost of parking. Bus line is across the street; an easy and inexpensive way to see the Alamo. The Tacueria across the street was good. South towards Military Drive is a good HEB Plus for groceries, WalMart, and La Perla and Nicha's Mexican restaurants (both excellent) and the Longhorn Cafe (great burgers) at City Base Landing. I had some work done at Discount Tire on Goliad, they were excellent. Just outside park is paved trail along the river. Besides the usual attractions, also recommend visiting the Natural Bridge Caverns and Wild Safari Park. City bus stop right across from RV park entrance that will take you to River Walk. Plenty of places to get good Mexican and BBQ nearby. Easy access to River Walk at front of Park. 5 miles to Alamo. Great bike riding and easy walking trail. Lots of birds. Walmart is only a few miles away. Only a mile off highway 10. Great overnight spot but lots to see if you have time to stay. Take the bus to the River Walk. The bus stop is directly across the street ($1.25 exact change). The River Trail is near the front of the resort. You can walk/run/bike the trail 5 miles to downtown or take a 15 minute ride on the bus. Water Pressure is high, if you don't have a regulator now is the time to get one. Really close to down town. Great breakfast tacos right across the street! Get out of the neighbor and go to the Riverwalk. Tuesday is free parking after 5 in San Antonio. Downtown and the Alamo are 3 miles north, we took the local bus ($1.20 exact change) and walked two blocks to the Alamo. We had lunch on the river walk, and took a lovely 35 min guided boat tour ($8.25). We will definitely come back to San Antonio next year, maybe in April during the annual Festival, for a longer (and cooler) visit. We took the city tour for 55.00 each which picked us up and dropped us off right at the front door of the campground. 8 hour tour that stopped at all the sites we wanted to see in one day in San Antonio. Very informative tour guide in a very comfortable bus. Would highly recommend. Great little Mexican restaurant across the street. Authentic Mexican Restaurant located directly across the street from park - breakfast, lunch and dinner. We did dinner one day and lunch the next: had to wait a minute for a table at lunch they were that busy with local diners. Also, City bus picks up and drops off on road in front of park - great way to get into town to the Alamo and not worry about where to park. Use the city bus to go to and from downtown. One of the reasons we chose this park was its proximity to downtown San Antonio. In our arrival packet, was information on how to get downtown by bus, cab, or drive. This was very helpful. We rode the bus downtown two days in a row for a $1.20 each (one way) for site seeing activities. After being on the road for nearly a month, this may be the nicest park we have stay at thus far. The next time we return to this area, we will definitely try to stay here again. Take the Grand Tour by Alamo tours - all day, see everything and be picked up at the front door of the office. Great value for your money. Walmart and other stores and gas stations nearby. Mission national historic park right up the street. Short ride to downtown. Bus stop across from park. Hosts gave us a lot of information about local attractions, restaurants, and how to get around. It's on the bus line so you can go to the Riverwalk and save the $20 you'd spend parking. It is also on the wonderful Riverwalk Bike Walking trail. Use the city's transit system to get into downtown - saves time and money. Are you affiliated with Travelers World RV Resort ?